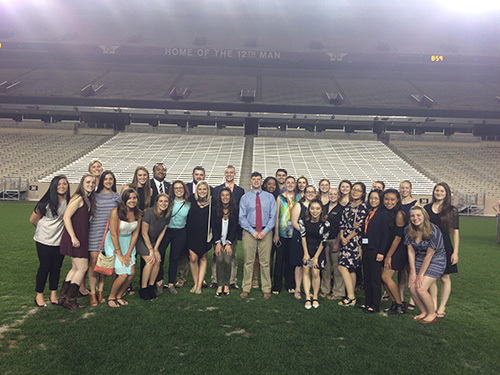 Purdue Veterinary Medicine's contingent of SAVMA Symposium attendees pauses for a photo-op in Texas A&M's football stadium, famous as the "Home of the 12th Man." The annual Student American Veterinary Medical Association (SAVMA) symposium began March 16 with over 30 Purdue Veterinary Medicine students in attendance. Held on the campus of Texas A&M University, the symposium continued for three days during spring break. The Purdue Student Chapter of the American Veterinary Medical Association (SCAVMA) was recognized at the event for having 100% of the College's DVM student body as members. SCAVMA provided travel grants to allow many of these students to attend. Students at the symposium participated in various lectures, social events, wet labs, and competitions to help further their veterinary education. Symposium highlights included the success of the Purdue Bovine Palpation Team. This was the first time in recent history that Purdue has had a bovine palpation team compete at the national level. This young team of six PVM students participated in three rounds of competition. First, they completed a written exam, then a practical style exam, and finally participated in live palpations. Purdue earned third place out of nineteen tough teams. The team members include Alex Hegg, Sarah Garst, Laura May, and Maggie Kelly, all of the DVM Class of 2019, and Katherine Kelsey and Trey Gellert, of the DVM Class of 2020. In addition, Trey came in third place during the individual portion of the competition. Congratulations also are in order for Purdue's SAVMA Senior Delegate, Taylor Dewitt, of the DVM Class of 2019, who was elected as the incoming Veterinary Economics Officer, a national SAVMA position, during the symposium. Taylor gave her candidate speech to the attendees as part of the program. Overall, SCAVMA is very proud of the students' accomplishments, and the chapter looks forward to a good Purdue contingent attending the SAVMA symposium again next year. Editor's note: special thanks to Purdue SCAVMA President Kimberly Lutz and PVM Clinical Assistant Professor of Theriogenology/Production Medicine Jennifer Koziol for contributing information and photos for this story. 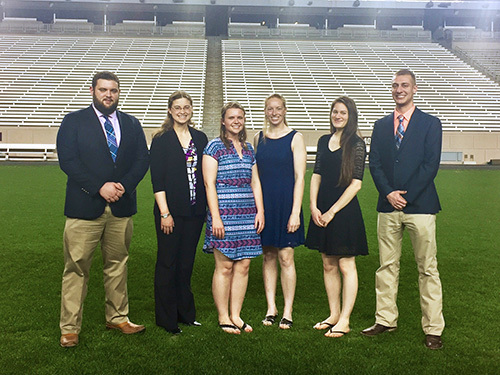 Members of the successful Purdue Bovine Palpation Team (left-right): Alex Hegg, Sarah Garst, Laura May and Maggie Kelly, all of the DVM Class of 2019, and Katherine Kelsey and Trey Gellert, of the DVM Class of 2020. 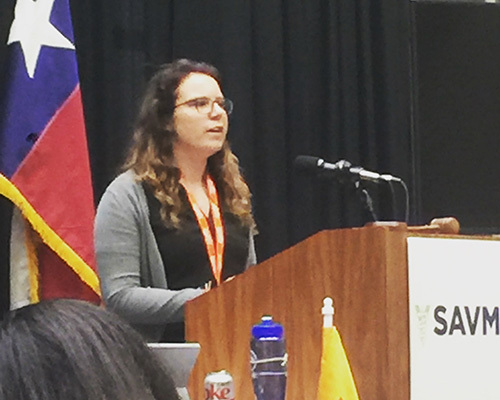 SAVMA Senior Delegate Taylor DeWitt, of the DVM Class of 2019, gives her candidate speech before being chosen for the national position of Veterinary Economics Officer-elect during the SAVMA Symposium.